The tournament will follow single round robin elimination and “knock out game” for the final and championship round. The MEABT 2018 carries the theme, “Journeying Together as a Global Family”, with the call of the 22nd Chapter of the Marist Institute. 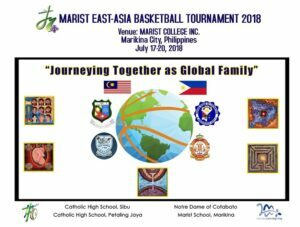 The tournament is also dedicated to the commemoration of the 70th year anniversary of Marist presence in the Philippines and the foundation of Notre Dame of Cotabato, and the 10th year anniversary of Marist East-Asia Province. The MEABT was started by the Marist Brothers in Hong Kong and the Marist Schools Alumni Association in 2017 in conjunction with the celebration of Marist 200. It is organized in the spirit of collaboration and network building among students of Marist schools in East Asia and other regions. It is aimed at the promotion of partnerships, brotherhood, social interaction, character building, values formation and competency development.